JLU School of Commerce and Economics organized an Intra University Debate Competition on "Post Budget Analysis: Pragmatic or Idealistic" at Jagran Lakecity University on 7th February 2019. Critical analysis and deliberations were surfaced by the students on Changed Policies; New Tax Slab, Unemployment Shortcomings, fiscal prudence etc. Students from different schools of Jagran Lakecity University came forward to speak 'for' and 'against' the motion. Prof (Dr.) Anjali Jain, Department of Economics, IEHE Bhopal and Mr. Sanat Shrivastava, owner of Ecoholics - Youtube channels & application were honoured as the judges for the occasion. The event was graced by Prof. Diwakar Shukla – Director, Jagran School of Journalism and Communication, Prof. (Dr.) Rajesh K. Yadav, Director, JLU School of Commerce and Economics and Prof. (Dr.) Vinay Joshi, Director Research, Jagran Lakecity University. In his welcome address, Prof. (Dr.) Rajesh K. Yadav, Director, JLU School of Commerce and Economics greeted all the esteem guests and duly appreciated the efforts of faculties and students for organizing such an informative event. The students highlighted various praiseworthy steps like new policies and changed tax slab etc. On the other hand problems of unemployment, rising challenges of manufacturing sectors etc were also raised. Prof. (Dr.) Anjali Jain, in her discourse, congratulated the students for their in-depth analysis and also gave a detailed overview of the budget. Mr. Sanat Shrivastava praised the students and the level of competition. According to his expertise, he highlighted the economic side of the budget giving instances of inclusive nature, fiscal prudence etc. Ms. Saniya Zia, JLU School of Law who spoke 'for' the motion and Ms. Sonal Sharma of JLU School of Commerce and Economics, who spoke 'against' the motion, were declared the ultimate winners. 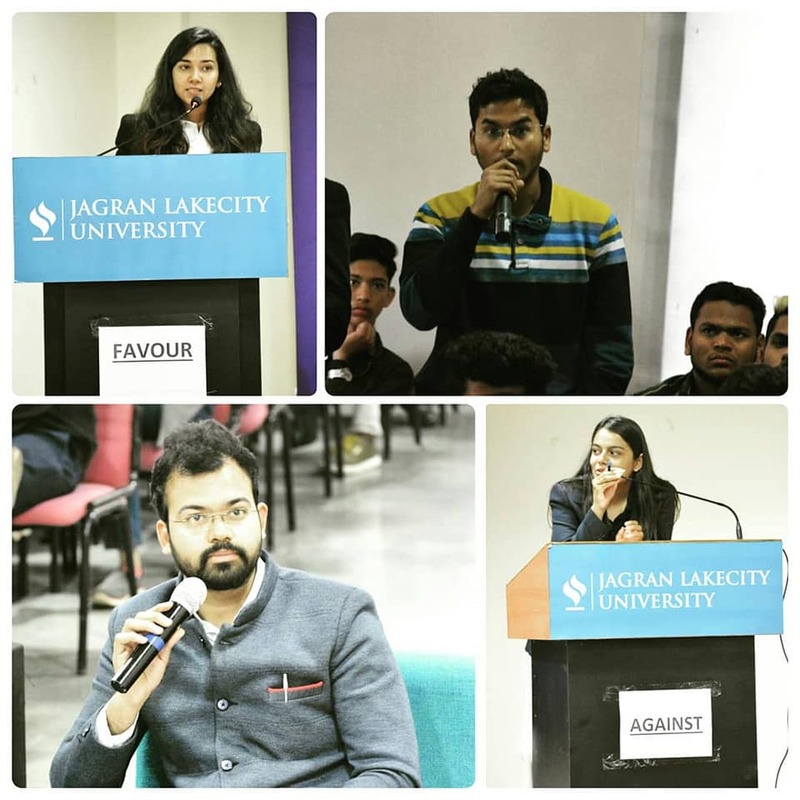 Both the winners will represent Jagran Lakecity University in an upcoming “Big Fight” event which will be organized by JLU School of Commerce and Economics on 28 Feb 2019.